There are a couple of striking differences when it comes to the design of these two devices. 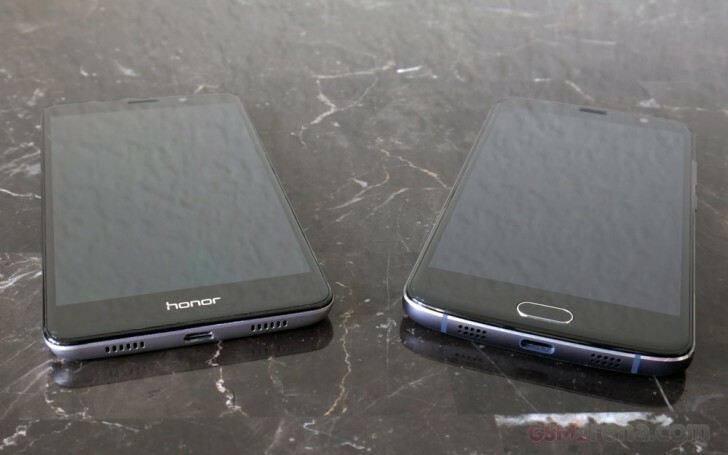 Honor went with a simplistic metal-wraparound design with upper and lower plastic bumpers to let signals pass through. On the other hand, ZTE's design is more robust, with a metal midsection that wraps all the way around the border of the phone. Meanwhile, the back is a soft-to-the-touch rubbery texture. Both designs feature slight curvatures for improved ergonomics, but one device's design is clearly superior. If you haven't already seen it, the Honor 6X has been tested for durability and the results are not in Honor's favor. The Honor 6X's structural integrity was simply not enough to handle the pressure of a bend test. Not to mention, the 6X build contains more plastic than the V8 Pro. Durability aside, these two phones are quite opposites when it comes to aesthetics. The Honor 6X is more "chic", if you will. It has a 'daintier' design and appears more feminine in comparison to the beefier appearance of the Blade V8 Pro. Some may argue that the Honor 6X looks basic and doesn't try to stand out in any way, others might call it 'minimalistic'. On the flip side, ZTE did a great job visually with the Blade V8 Pro. Much like the ZTE Axon 7, the phone maker made an effort to build the Blade V8 Pro with a distinctive design, making it easy to tell apart from other smartphones sitting on a table. Going back to durability, the Honor 6X does not have Gorilla Glass, nor does it have an oleophobic coating to keep the glass from smudging up. Although it does come with a factory screen protector pre-installed, this scratches up pretty badly. Meanwhile, ZTE's panel is protected by Gorilla Glass 3. 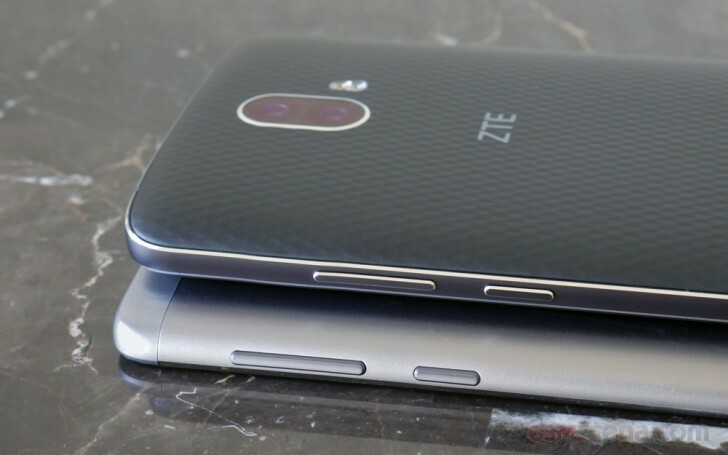 Winner: ZTE Blade V8 Pro. It has a far superior design in terms of durability and it is built to really take a beating. So, if we were to carry one of these devices without a case, without a doubt we'd go with the ZTE Blade V8 Pro. When it comes to displays, both devices are equipped with similarly spec'd panels. Both are 1080p in resolution and 5.5 inches diagonally. At first glance, you can definitely tell that the Honor 6X's display is superior to the Blade V8 Pro's. Observations aside, let's let the numbers speak for themselves. Both devices scored an average DeltaE of 5.6. The max Delta E is higher on the ZTE Blade V8 Pro at 9.7, which is due to a cooler appearance of white tones. The Honor 6X had the same issue with whites, but its deltaE was lower at 7.9 (the lower the DeltaE, the better). What this means is the Honor 6X is more color-accurate than the Blade. Though we wanted to compare the displays further, ZTE does not include a way to tweak the color temperature of its display while the Honor 6X gives you a color temperature sphere (which is difficult to use for tweaking, but at least it's there). Winner: Honor 6X. It has a vibrant display with more accurate colors and excellent viewing angles. As an added bonus, the 6X can reach a blinding 570 nits which powers through even the brightest of summer days. Both smartphones feature ample battery sizes that will satisfy the need for a long-lasting battery. The ZTE Blade V8 Pro carries a 3,140 mAh battery while the Honor 6X has a 3,340 mAh power pack. Despite a difference of just 200 mAh, the ZTE scored just a little higher than the Honor 6X did with an overall endurance score of 89h while the 6X scored 84h. The most apparent differences between these devices are how much power they consume in browsing and standby. ZTE scored three hours less in browsing, but about two more in talk time. Video playback was within the same range, but the ZTE was better in standby time, which boosted its overall score. As an added bonus, the ZTE Blade V8 Pro features Quick Charge 2.0 support, and the quick charger is included in the box (13.5W or 9V @ 1.5A). The same can't be said for the 6X, which charges at a slower 10W (5V @ 2A). Numbers aside, you'll get great battery life with either of these devices, and you're more than likely to get away with skipping that overnight charge. Both devices also feature advanced power management, which seeks out power suckers and allows you to whitelist or blacklist apps from running in the background, thus lengthening endurance between charges. Winner: Tie. Both smartphones offer advanced power management and the difference between scores is negligible. The ZTE Blade V8 Pro charges faster than the Honor 6X, so it may win this round if this particular feature is important to you.